Hot on the heels of the console release of Terraria comes news of a portable version. Terraria has been announced for the PS Vita. The port work is being handled by Engine Software, a studio with a history of portable ports below their collective belt. 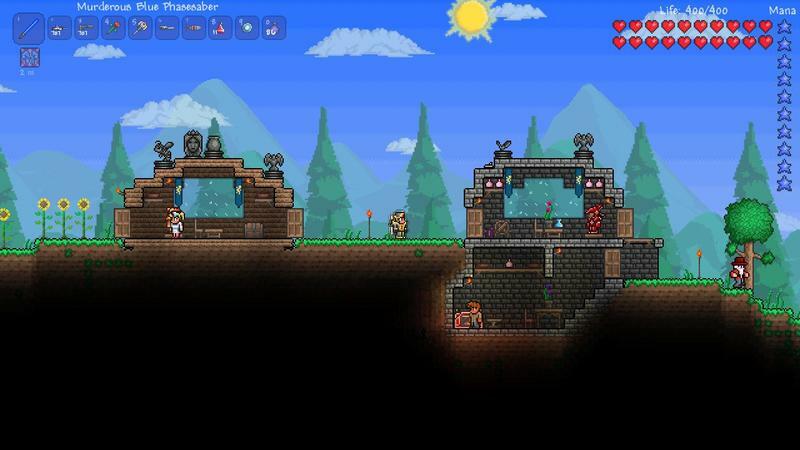 The console version of Terraria just released to strong reviews. It's currently available on the Xbox 360 and PlayStation 3. This port actually sports more content than the PC version, something longtime fans of Terraria have consistently expressed genuine frustration over. The press release announcing the PS Vita version of Terraria did not indicate how much content it will get. It does, however, mention in passing that it will feature touchscreen…something. We're still waiting for an exact release date, but expect Terraria to sell as a digital download for the PS Vita this summer. We'll have more on the game as we hear it. WOODLAND HILLS, Calif. – March 28, 2013 – 505 Games, a global publisher of video games, today announced that the block-building smash hit Terraria is headed to the PlayStation®Vita system (PS Vita). In development by Engine Software, Terraria for PS Vita will be available in summer 2013. Originally released in 2011 for the PC by creator/developer Andrew Spinks' Re-logic studio, Terraria has received universal, critical acclaim and over 2 million "Terrarians" have struck out on their own adventures and fallen for it's mix of side-scrolling, action-adventure gaming and emphasis on crafting and exploration. Tim Woodley, Head of Global Brand at 505 Games said, "We're all huge fans of Terraria and have been overwhelmed by the support we've received from the existing community since we began working with the property. And it's been amazing to see how many of those fans have been asking for a portable version of Terraria so they can take their adventures with them on the go. The biggest challenge for us is how to give players the control they need to fully enjoy the experience and we're really excited to explore the potential of the multiple input options that the PlayStation Vita affords us." Commenting on the announcement, SCEE's Senior Business Development Manager Shahid Ahmad said, "We are tremendously excited about bringing Terraria to PS Vita. It's fantastic news for fans who have been begging for the game to be available on PS Vita and it's fantastic news for us too, we are delighted about the addition to the platform. For us this is a real coup, the opportunity to bring such a loved game to one of our platforms is really exciting. We are also really confident about how much fans are going to love the PS Vita version; the touch screen will ensure a totally unique experience."